A. 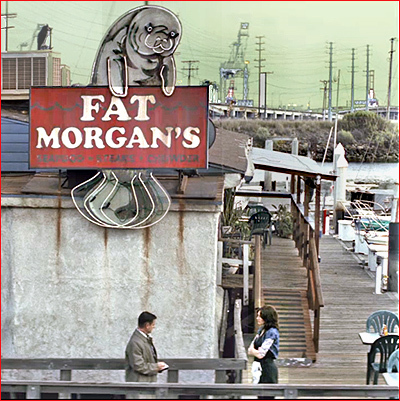 A tacky wharfside diner called "Fat Morgan's" ( with a sign out front featuring the cartoonish image of a fat manatee ). I initially assumed that the diner was in or near Tampa, Florida, the same as the Homecoming facility. But when Heidi meets up with Anthony at the bar, and he asks her how things are going in Tampa, she remarks that she moved back in with her mother, which seems to suggest that her mother's house isn't in Tampa. She also mentions "moving down there" when she speaks of taking the job in Tampa, with Homecoming. That seems to indicate that her mother's house is farther north in Florida than Tampa - but that still covers a lot of possible locations for her mother's house and this diner. So, at this point I'm still uncertain of exactly where the diner is supposed to be, other than it is obviously at the waterside, somewhere in Florida. This floating, "greasy spoon" diner is where Heidi ( Julia Roberts ) works as a waitress in 2022, after having left her job at Homecoming. 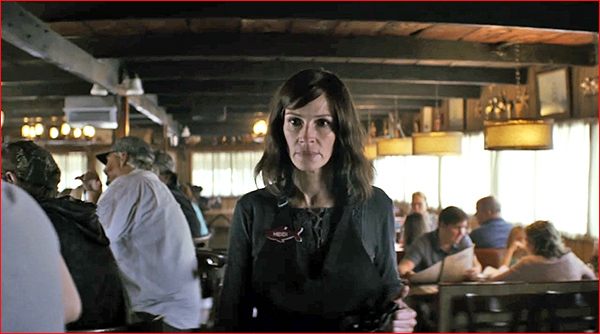 We first see this diner in Episode 1 ("Mandatory"), at 03:22, when we see Heidi waiting tables there. We see it again later, at 21:35, when the DOD investigator, Thomas Carrasco ( Shea Whigham ), arrives to ask her questions about her time working at Homecoming -- but she tells him she doesn't remember. In Episode 5 ("Helping), at 17:15, we see the diner again in a scene where sleazy Colin Belfast ( Bobby Cannavale ) comes to Fat Morgan's, planning to confront Heidi, only to discover that she doesn't remember him. Fat Morgan's is glimpsed again briefly in Episode 7 ("Test"), at 08:04, when Colin parks in its parking lot and spies on Heidi. 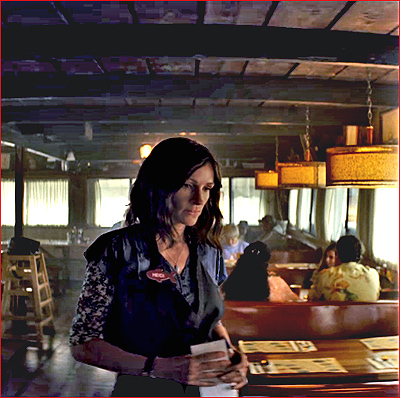 In Episode 9 ("Work"), at 17:45, Heidi returns to work at the diner, only to discover that an elderly customer, who used to fall asleep at her table, has died there. A. This actually is a floating diner - but a long way from Tampa. A. 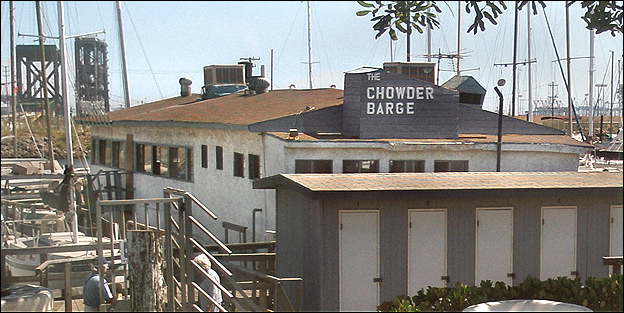 These diner scenes were filmed at a floating barge diner called The Chowder Barge. 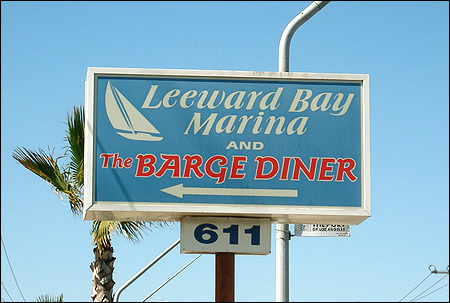 You'll find it at a somewhat seedy little marina called Leeward Bay Marina, at 611 N. Henry Ford Avenue, just north of Terminal Island, on the Wilmington / Long Beach border. That's just west of the Henry Ford bridge, where the Dominguez Channel passes under Henry Ford Avenue, just SW of the intersection of E. Anaheim Street and Henry Ford Ave. 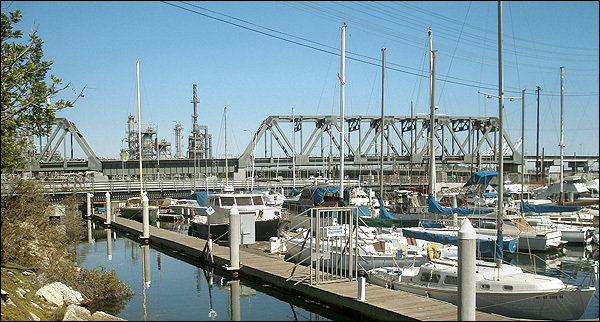 While most marinas tend to be in upscale areas, working-class Leeward is lost in a rough, isolated, industrial area on the Long Beach/Wilmington border. The boats the marina houses tend to be older ones, often with live-aboard owners. The waters around it are reportedly badly polluted, with residents joking about the marina being "where the sewer meets the sea". Railroad trains hauling freight chug by on the nearby trestle/bridge, and next door are storage yards and mammoth cranes. 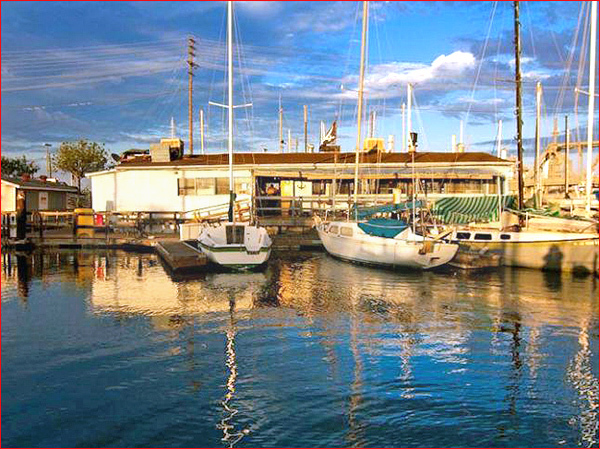 The restaurant at its center is a local landmark of sorts, a floating, tilting diner, known as "The Chowder Barge", which has been around since 1934, and has been moored at this marina since the late '60s. 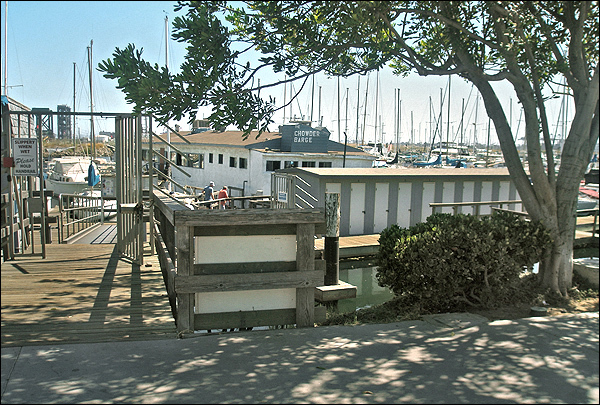 The original barge that now houses the Chowder Barge was reportedly built in 1934 as an on-location commissary during the filming of the movie "Mutiny on the Bounty" (starring Clark Gable & Charles Laughton). Over the years, it has reportedly been, and I quote, "a floating brothel, a houseboat, a machine shop, an art studio and an abandoned hulk". Since 1967, it's been run by a lady named "Miss Mary", a temperamental sort who serves as waitress, cook, clerk & cashier. A. This is a location I had found once before, way back in 2005, when I was tracking "Dexter" locations. And I'm lucky I had already found it, because this could be a very difficult place to track down from scratch. It's out in the middle of nowhere, in an obscure marina on the Wilmington/Long Beach border, and it's a floating barge ! 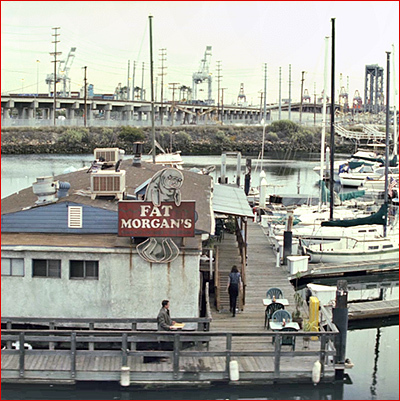 Fortunately, the same floating barge / diner was used in a few episodes of "Dexter", as the marina where Dexter kept his boat, the "Slice of Life", and they shot several scenes there. You can read one of my 2005 pages about that "Dexter" scene here. I found it the first time because the Dexter scene had a good view of the easily -recognizable Henry Ford Bridge. That bridge has appeared in a number of films, so I was familiar with it, and was able to use aerial photos to locate the barge in relation to the bridge.